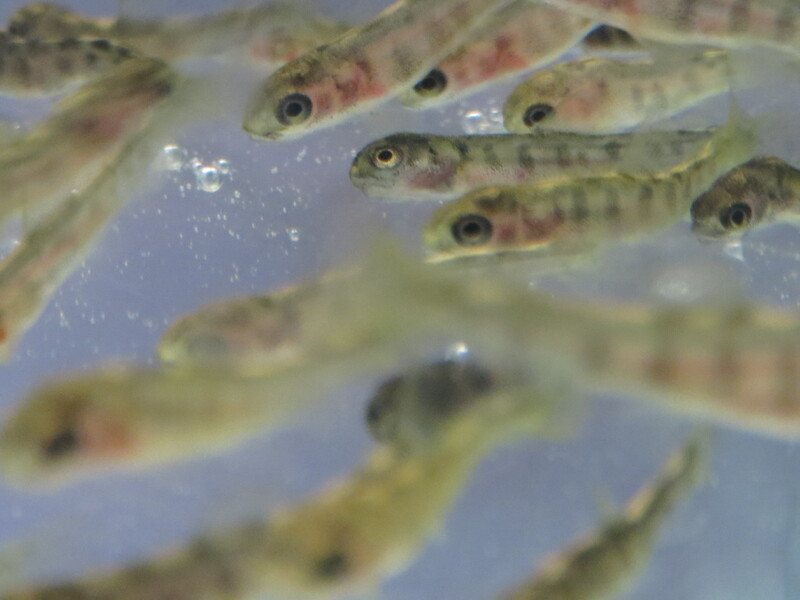 Students at GEHMS use a camera and computer monitor to view the growth process of tiny Brown Trout in our school life science lab. 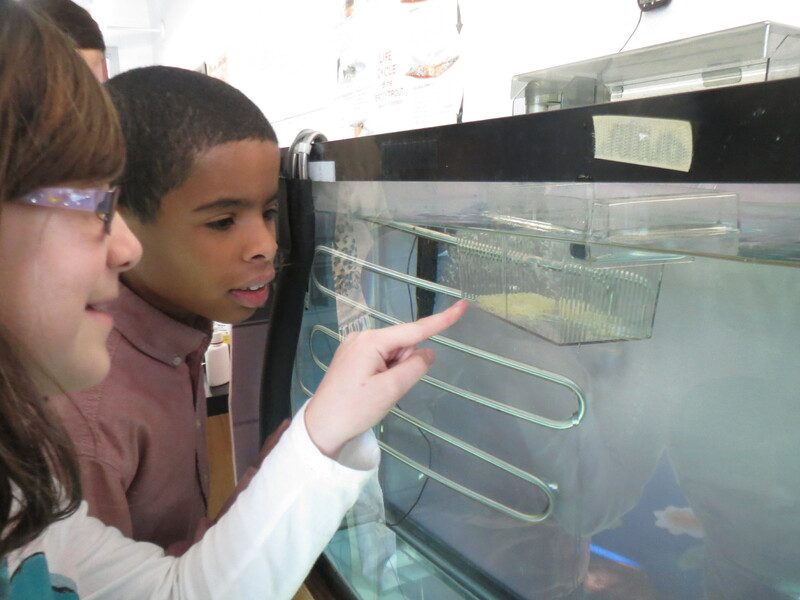 Our third graders in the photos above have lots of observations and questions about the tiny fish. Thank you, fourth grade scientists, for taking such good care of our small, delicate Brown Trout! Today our readings were all good: pH=7.1, Nitrates=0 ppm, Amonnia=0 ppm. We did not change the water because the chemistry today was perfect for our small Brown Trout. We noticed the eggs that need to be removed. we also noticed the eggs sacks on the trout’s stomach; this is what they feed on. We had to take about 12 egg cases out of the fish basket (see photo above) where the small fish or alevin are growing. We also noticed that some were dead egg shells (see photo above). We have to take these out or the egg cases will rot and decay and they will get bacteria in the water. How long can trout live and grow? And by these pictures you can see that the trout are doing well. If you have any suggestions for us please leave a comment on our blog. Thank-you! The trout are about 3/4 of an inch. 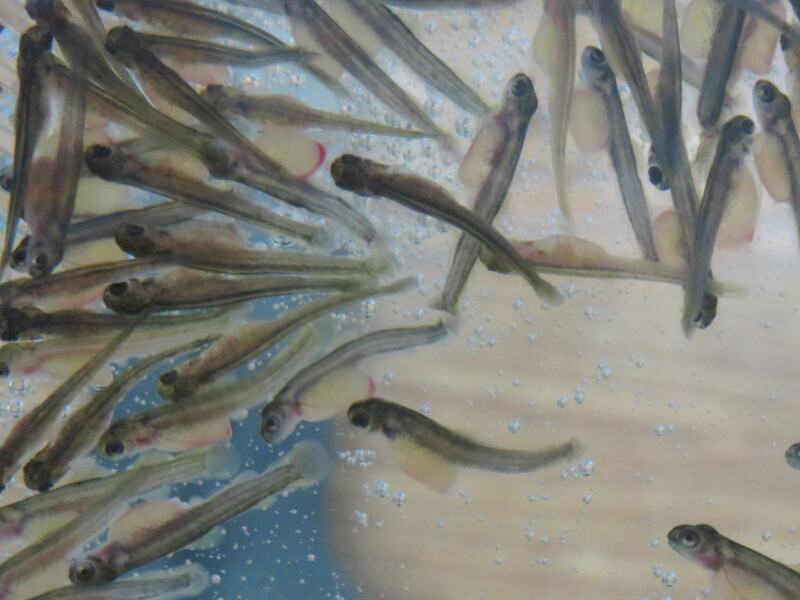 We released them into the big tank and they are in the fry stage. This week only one trout died. Next week we are switching to size one in food. Did our Brown Trout hatch? We have many questions today about the trout in our tank. Have the trout hatched? Did they all survive? Are they swimming? How big are they today? Mrs. Saunders and Mrs. Martin are together teaching our new trout helpers how to do the chemical testing and water changes. The temp is 50.2, PH is 6.4, Ammonia is 0.25, Nitrate is 0, Nitrite is 0, the water change was 3 gallons. feeding time was 12:50 trout loss was 120 so we have 80 living trout. The trout are so big, I feel that they are safe. 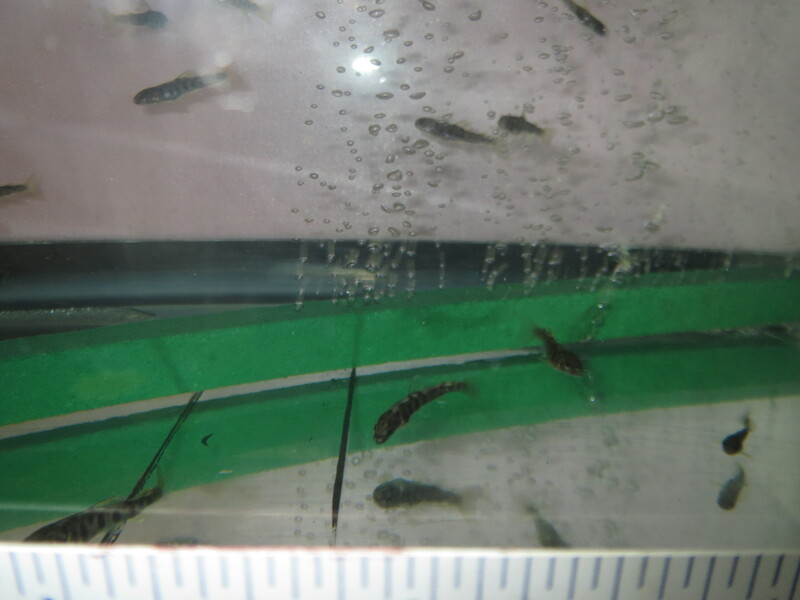 The tank is healthy the trout are strong and are eating # 1 food pellets they are 1 1/2 inches long, we are so proud to have are trout growing stronger. Fry to Fingerling! The fish are getting bigger and enjoying the BIG tank! ‘Oh My Goodness they are fingerlings! When the fish develop vertical line marks on their sides, they are called Fingerlings. These marks help them hide in grass from predators as they grow! The water chemistry is 6.6 for PH, 0.25 for Ammonia, 0 for Nitrite, 5.0 for Nitrate , the water change is 2 gallons. There feeding time was 12:40 the trout loss total so far is 121 from the beginning- bad eggs and fish. The ones we have are healthy. 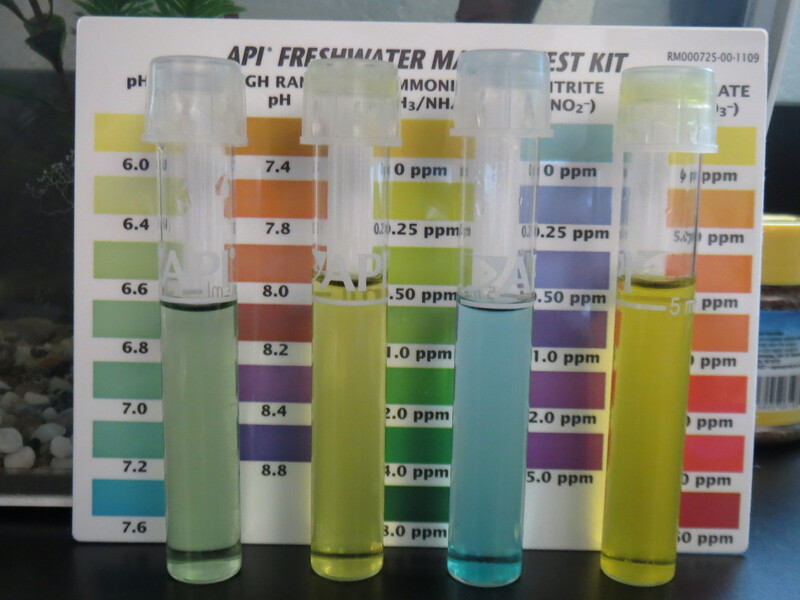 We may start doing a bigger water change because the Nitrate is not good. The trout are eating 2 dropper tips of 0 and 1 dropper tip of 1, they are also getting bigger ( 1 inch and a 1/2 ). 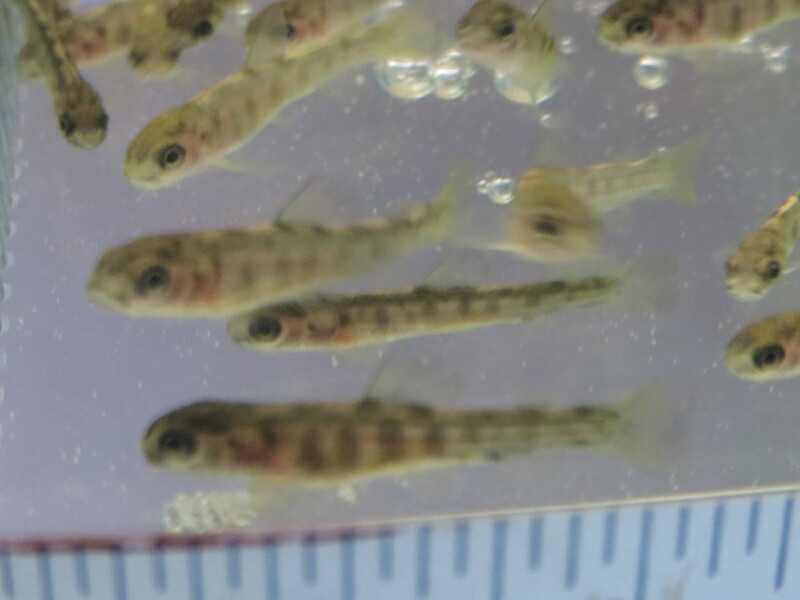 Our Baby Trout are GROWING! The trout are in the fry stage. Some are weak and some are strong.They are 1 inch long. The temputure is 50.2, the ph is 6.6, the ammonia is 0.25, the nitrite and nitrate are 0, our water change is 2 gallons our feeding time was 1:42 and our trout loss was 6 trout. The trout ate more than usual. A exciting thing is that today, we get to release them into the bigger tank. Alevin Are Starting To Swim Up! OMG!The eggs have all hatched! Some alevins are swimming up to the surface. Our testing today was 50.4 for temp. 6.4 for ph, 0. for ammonia, nitrate 0.5 and nitrite 0. So the water is still in good condition. We did a 2 gallon water change. No losses today. our total losses are 84 out of 200. The alevins are sooooooooooooooo cute with there cute faces. TIC is Ready for Action-Eggs are Hatching! 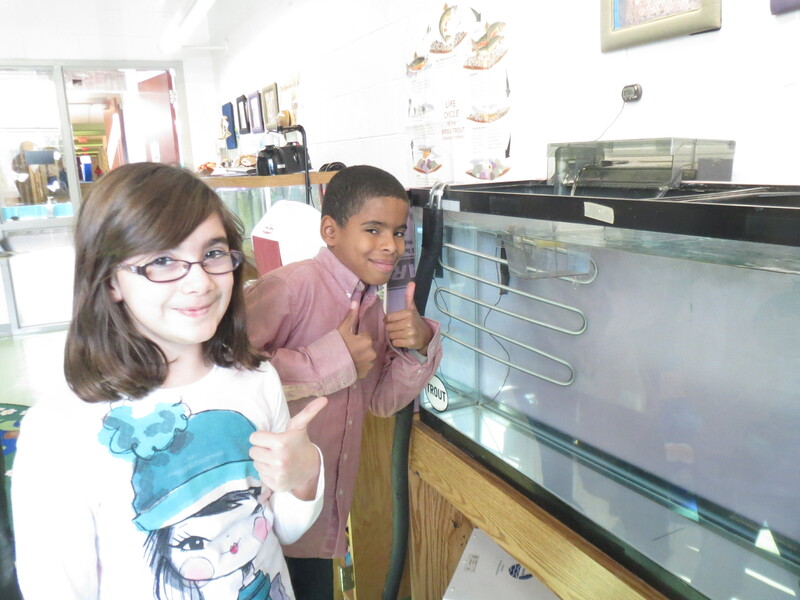 We received the trout eggs November 18,2014. A Big Thank you to the TU Crew!! 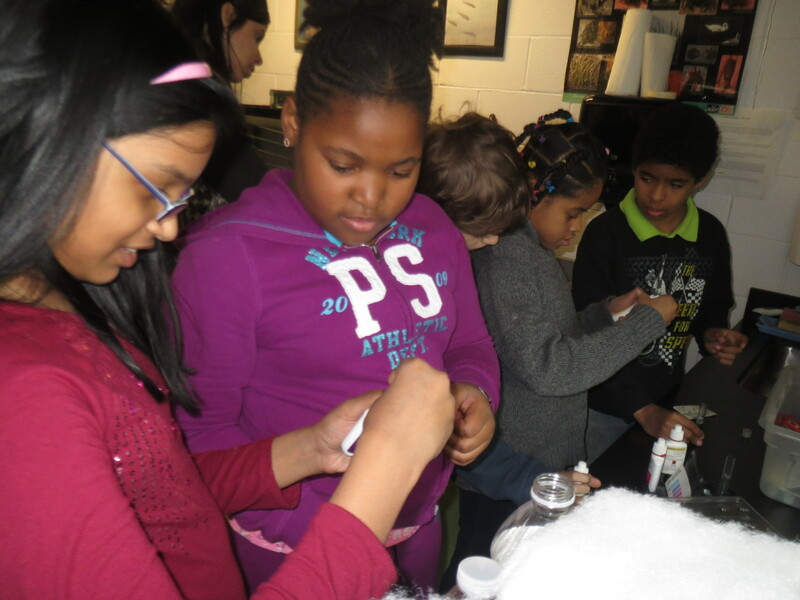 2 weeks later, we noticed on Dec. 1, a few eggs started to hatch before our eyes! 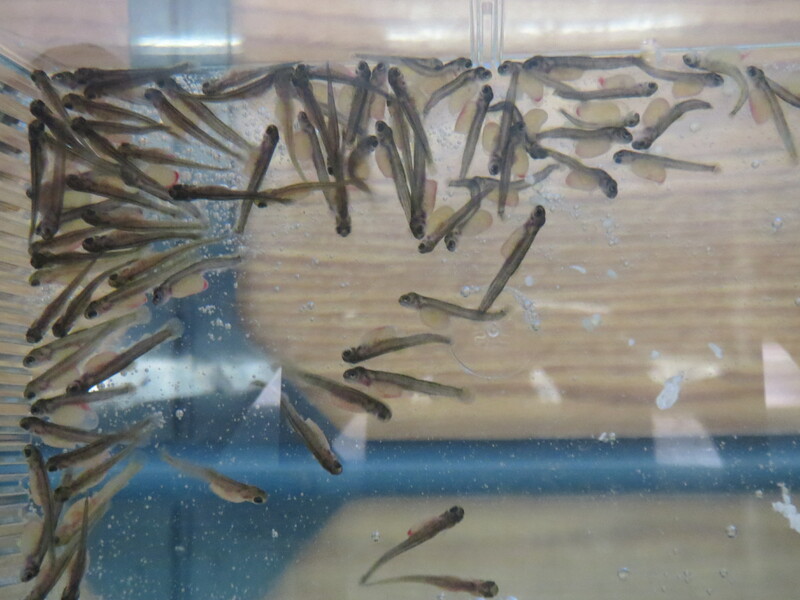 today we noticed Lots of trout have hatched, but we had to remove 15 more eggs that were not fertile. Our chemistry for today was 7.0 for pH, .25 for ammonia, 0 for nitrite and 0 for nitrate. we did a 2 gallon water change and its 52.3 degrees. We are happy that the chemistry is where its supposed to be and that some trout have hatched. “It is fun to be a trout helper,” says 2 students from 4S. Bye! Bye! BabyTrout! Have a Nice Life! 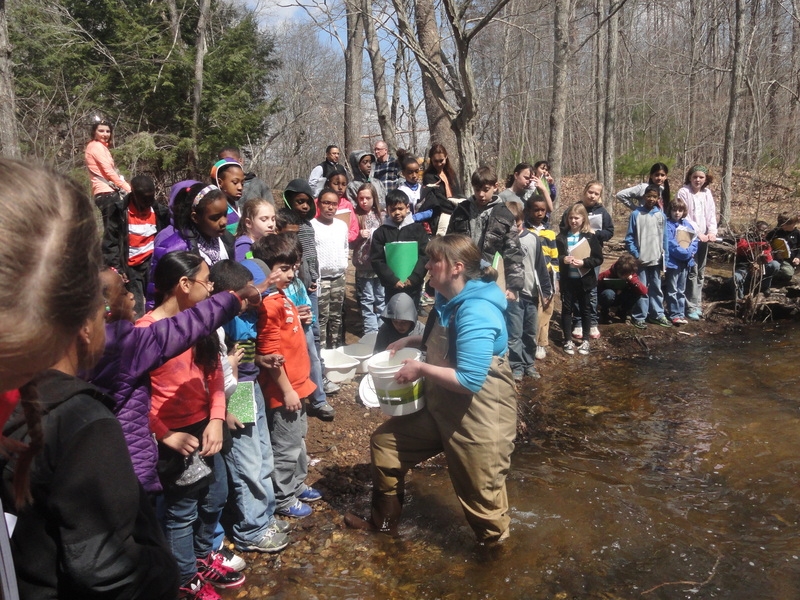 and their 70 baby trout took a bus ride to Blackledge River in Marlborough, CT.
Students were split up into groups and visited different stations along the rivers edge. 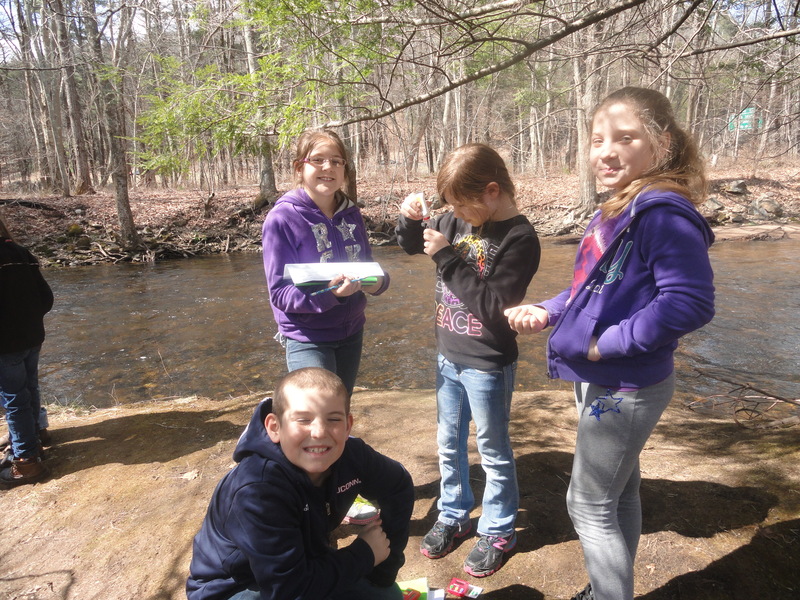 Students recorded the environment with digital cameras, they also sifted through the sands and rocks to find organisms that would suit the brown trouts appetite. The chemisrty station allowed each student to take part in testing the river water to see if it would be the ideal home for their babies. As they walked along the river’s banks, they noticed erosion from flooding, the water depth and how fast it was running. They recorded their findings and decided that this was the perfect place to set their trout free. Mrs. Rand and Mrs. Garbart adorned waders and proceeded into the rushing waters to scrape the bottom for tiny creatures that the trout feed on. We all learned that if this environment was sustainable for these creatures, it should be great for the trout too! A great learning experience was had by all. It was wonderful to get the students outside exploring and experiencing the world around them. A BIG Thanks to all the parents and an uncle that volunteered their time for the 4th grade Trout in the Classroom Project. From supervising the chemistry testing in school to braving the river banks of Blackledge, without you, this could not be possible.